At least 98 people have been confirmed killed, with the death toll expected to rise, after a 6.9-magnitude earthquake struck off the coast of Indonesia’s Lombok Island, devastating the popular tourist destination. As rescue workers try to clear rubble following Sunday’s quake, which flattened and damaged more than 13,000 homes, the National Disaster Mitigation Agency (BNPB) said they expect the death toll to rise even further, according to Reuters. Tremors caused by the quake were also felt on the nearby island of Bali, where two deaths have been recorded. Lombok, an island of three million people is a popular backpacking destination. No foreigners were identified among the dead, while 236 people were also injured, BNPB spokesman Sutopo Purwo Nugroho told a news conference. Fear that the quake would result in a tsunami has prompted holidaymakers to flee the surrounding areas in panic, with officials saying that 2,000 people had been evacuated from the three Gili Islands off the northwest coast of Lombok. 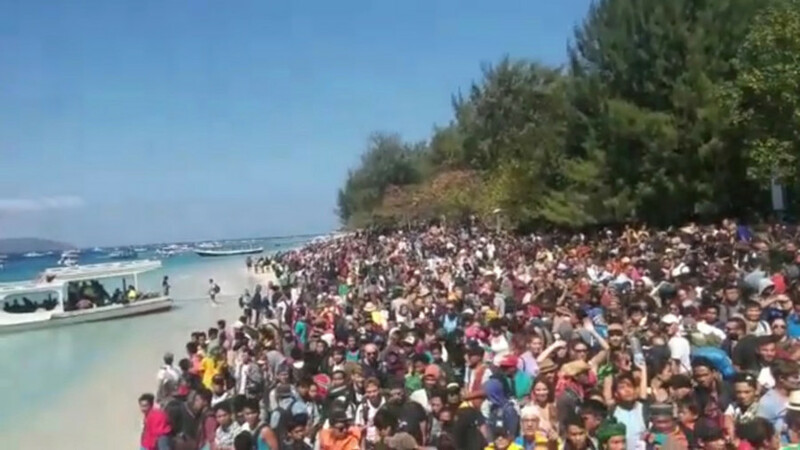 Footage posted on social media shows queues of people lining up on the beach to get off the island via boat. Michelle Thompson, an American holidaying on one of the Gilis, described a “scramble” to board boats leaving for the main island, during which her husband was injured. “People were just throwing their suitcases on board and I had to struggle to get my husband on, because he was bleeding,” she told Reuters. On Lombok Island, long lines have been reported outside the main airport, where airlines have scheduled an additional 18 flights to help deal with the mass exodus of visitors. Some, however, kept calm when the terrifying quake struck. Footage shows one man continuing to pray through the ordeal while tremors can be clearly seen in the Mosque. The latest quake comes a week after an earlier 6.4-magnitude quake near the island, which killed 14 people.